Prepare marinade by mixing together wine, soy sauce, sugar, and ginger. Marinate meat in mixture while preparing vegetables. Heat 1 Tbsp oil in large skillet or wok. Stir-fry onions and mushrooms for 3 minutes over medium-high heat. Add celery and cook for 1 minute. Add remaining vegetables and cook for 2 minutes or until green pepper is tender but crisp. Transfer vegetables to warm bowl. Add remaining 1 Tbsp oil to skillet. Stir-fry meat in oil for about 2 minutes, or until meat loses its pink color. Blend cornstarch and water. Stir into meat. Cook and stir until thickened. 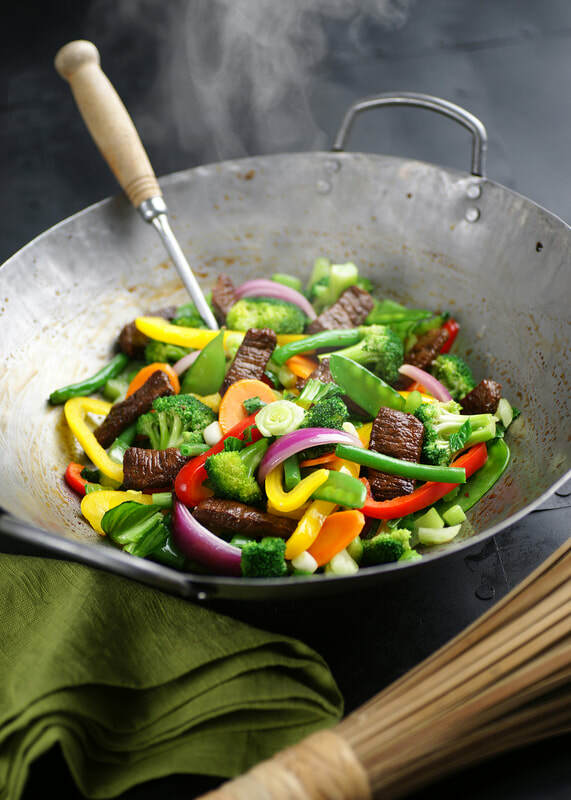 Return vegetables to skillet. Stir gently and serve.